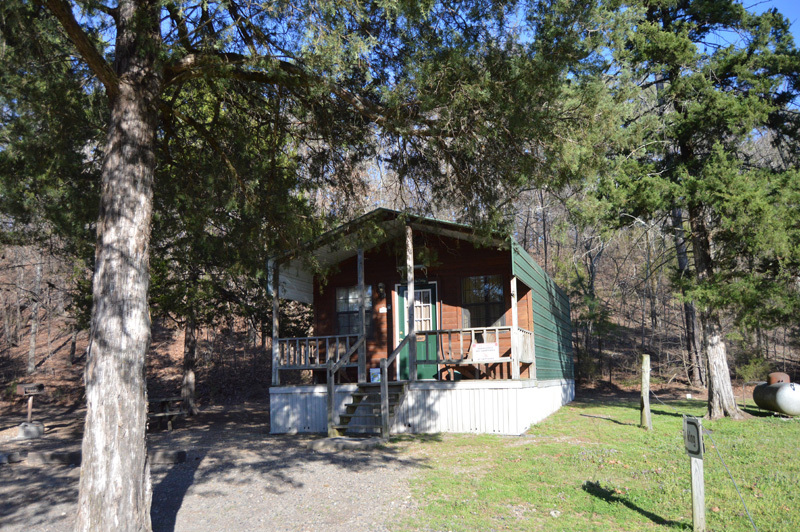 The “Pine” is a 2 bedroom cottage with all the amenities of home. 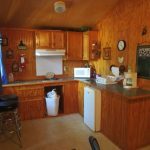 Decorated in a colorful John Deere and Sunflower decor, this cottage has a kitchen that includes a cook top, dorm size refrigerator, coffee maker, toaster, microwave and dishes. 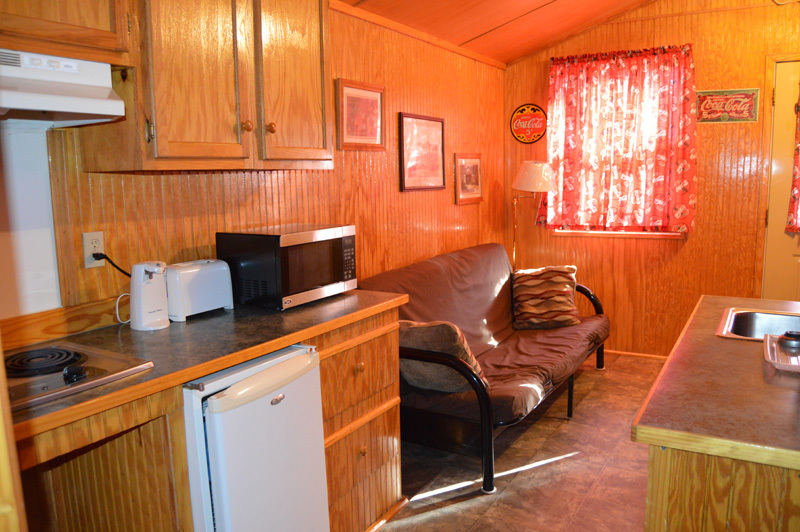 The living area has a futon couch (which makes into a full size bed), chair, and satellite TV with VCR. 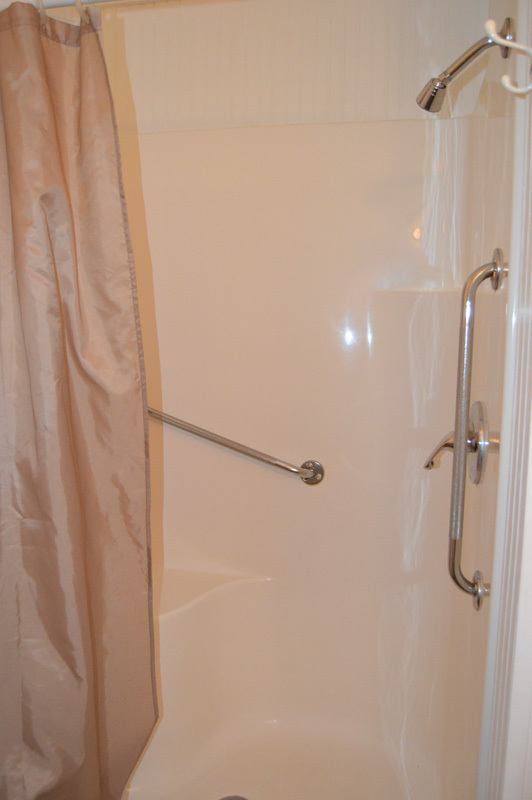 Full bath (shower, no tub) stocked with towels and toiletries. 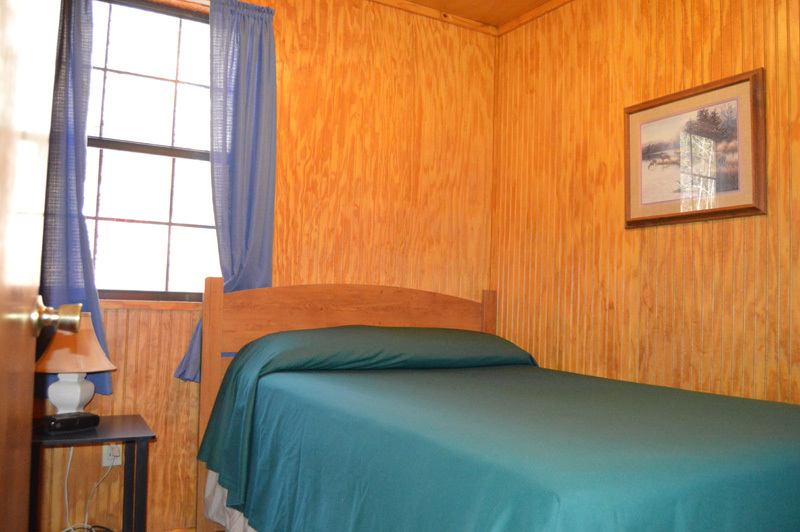 The bedrooms have full size beds. 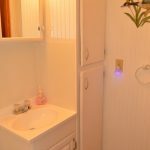 Electric heat/air. 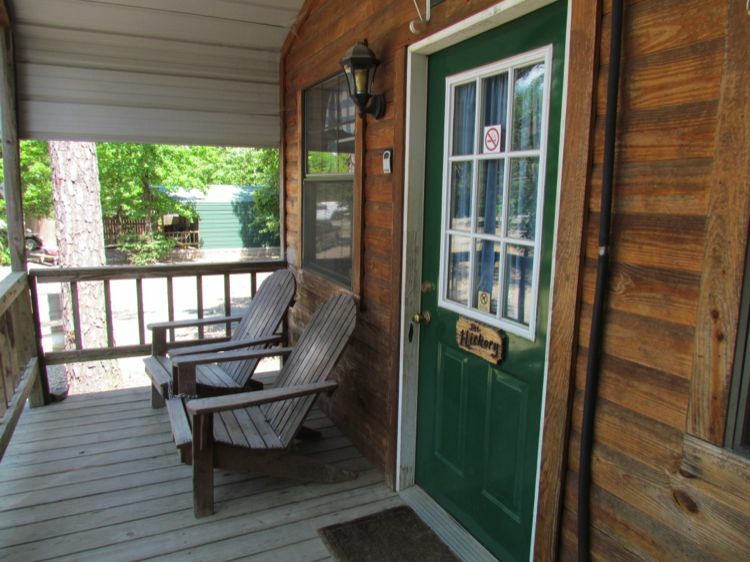 The front porch has Adirondack chairs to sit and enjoy a cool breeze and a good visit. 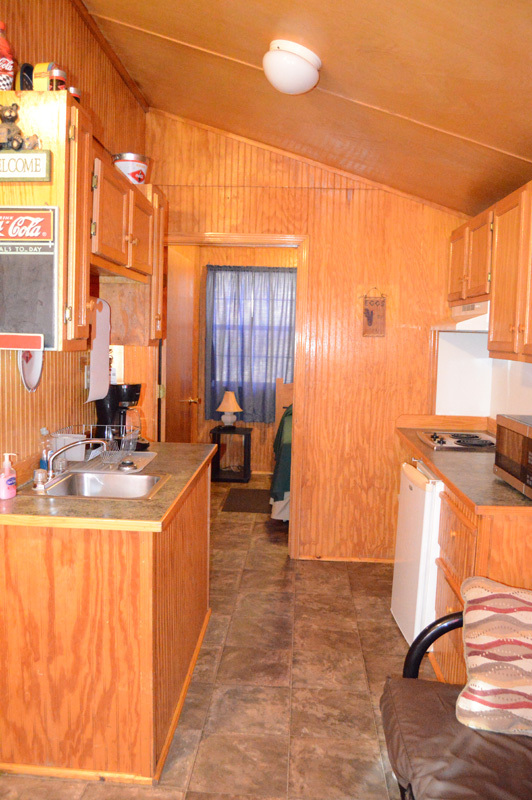 There is also a picnic table and barbecue grill for special family time. 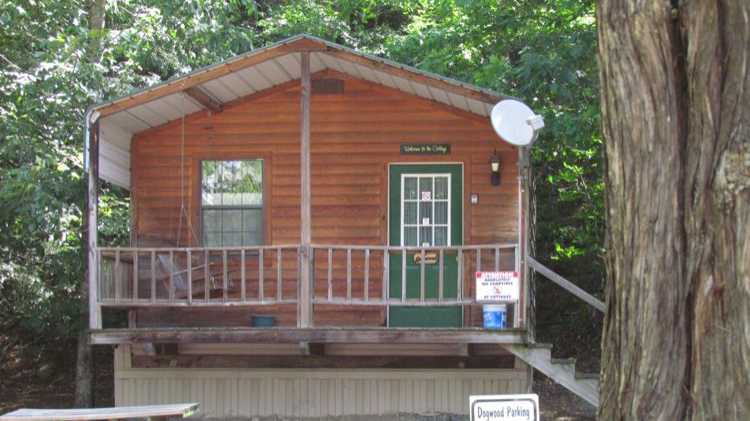 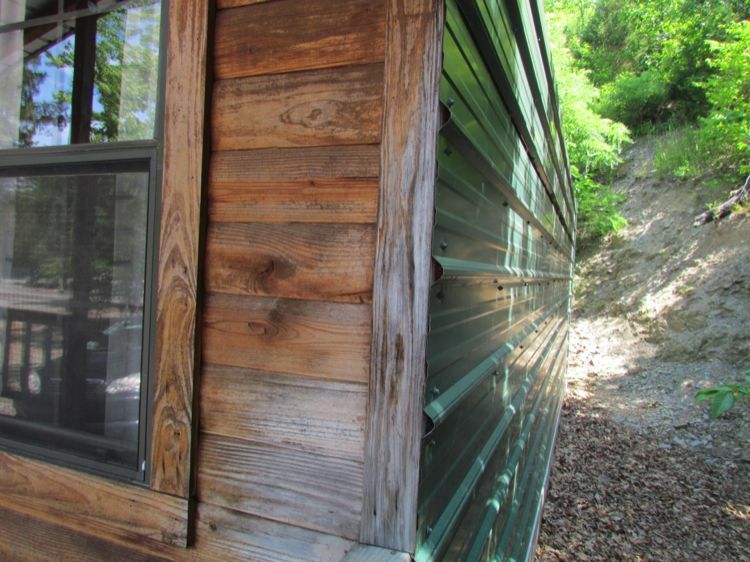 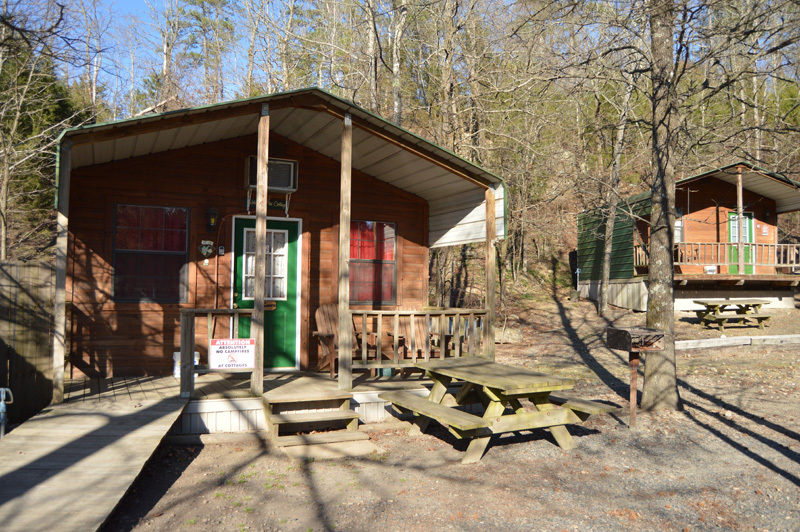 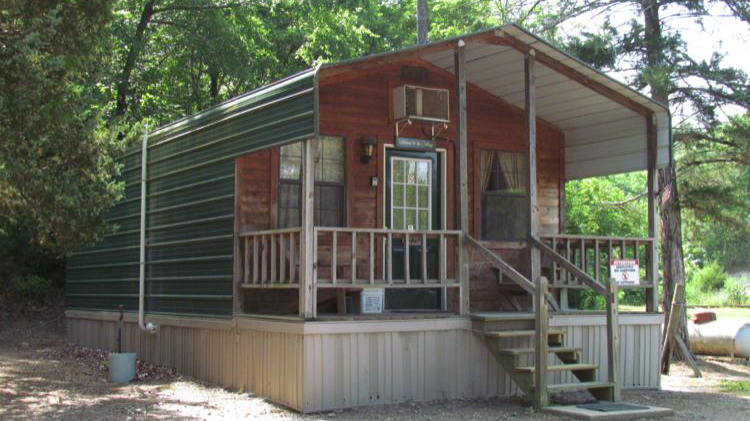 The “Cedar” is a 2 bedroom cottage with all the amenities of home. 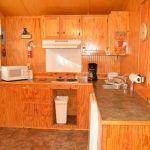 Decorated in a wildlife decor, this cottage has a kitchen that includes a cook top, dorm size refrigerator, coffee maker, toaster, microwave and dishes. 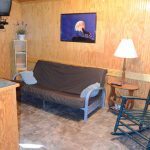 The living area has a futon couch (which makes into a full size bed), chair, and satellite TV with VCR. 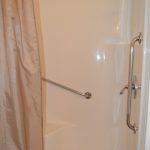 Full bath (shower, no tub) stocked with towels and toiletries. 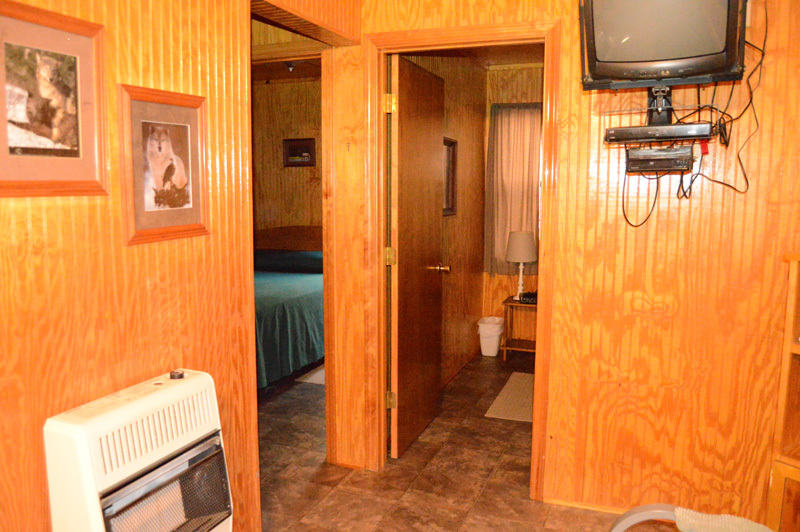 The bedrooms have full size beds. 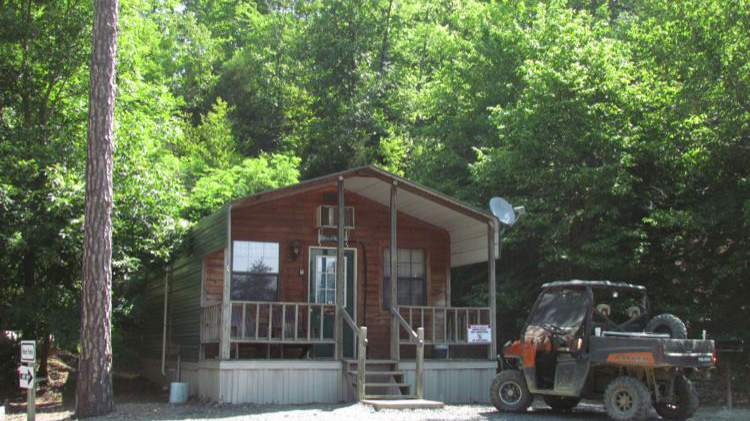 A/C & gas heat. 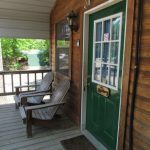 This cottage has an inviting front porch, and a picnic table and barbecue grill for special family time. 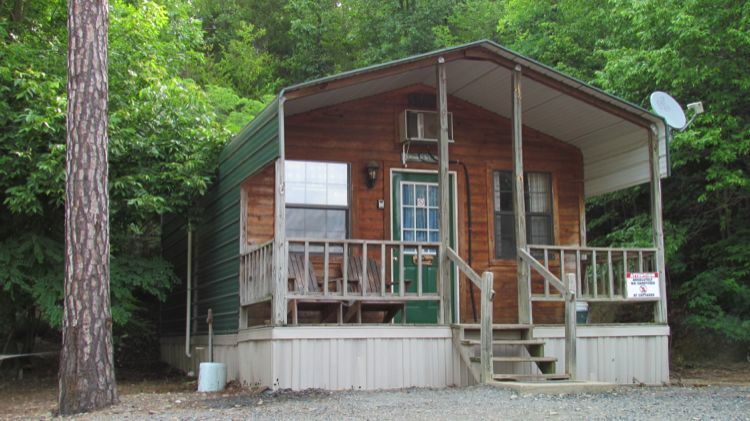 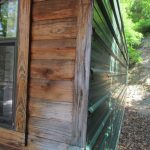 The “Hickory” is a 2 bedroom cottage with all the amenities of home. 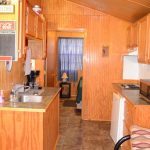 Decorated in a county theme reminiscent of Grandma’s house, this cottage has a kitchen that includes a cook top, dorm size refrigerator, coffee maker, toaster, microwave and dishes. 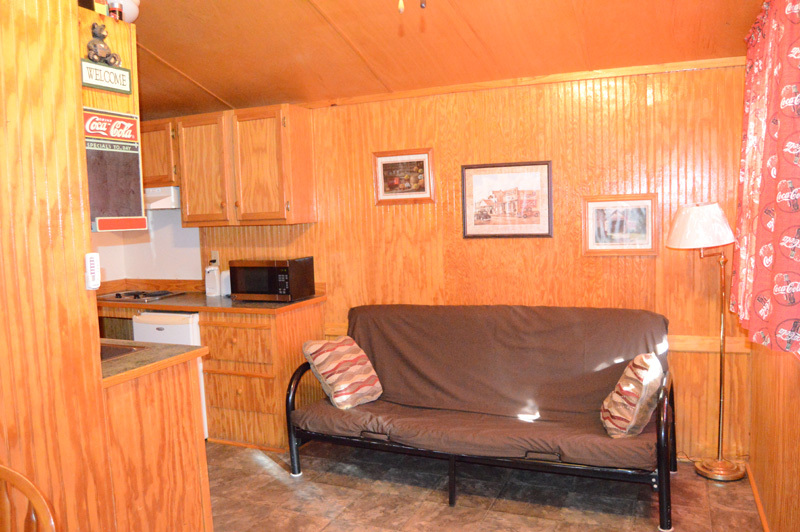 The living area has a futon couch (which makes into a full size bed), chair, and satellite TV with VCR. 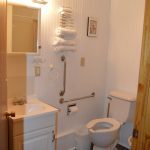 Full bath (shower, no tub) stocked with towels and toiletries. 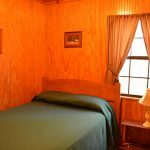 The bedrooms have full size beds. 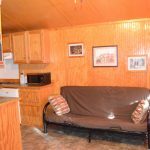 A/C & Gas heat. 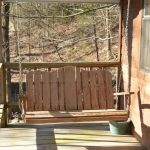 This cottage has an inviting front porch, and a picnic table and barbecue grill for special family time. 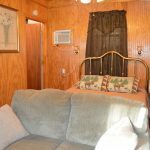 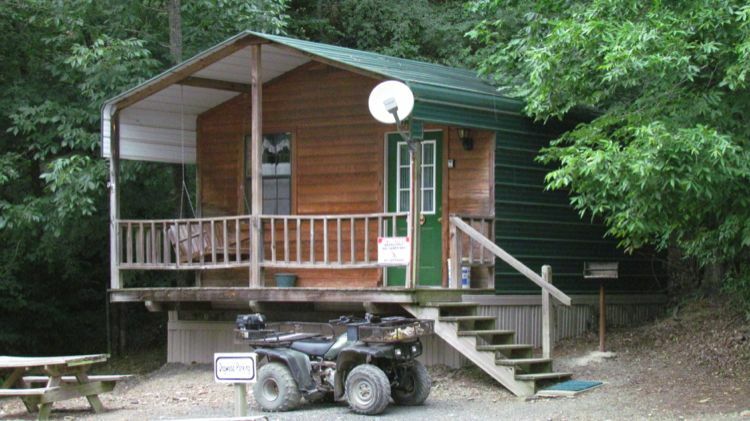 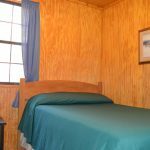 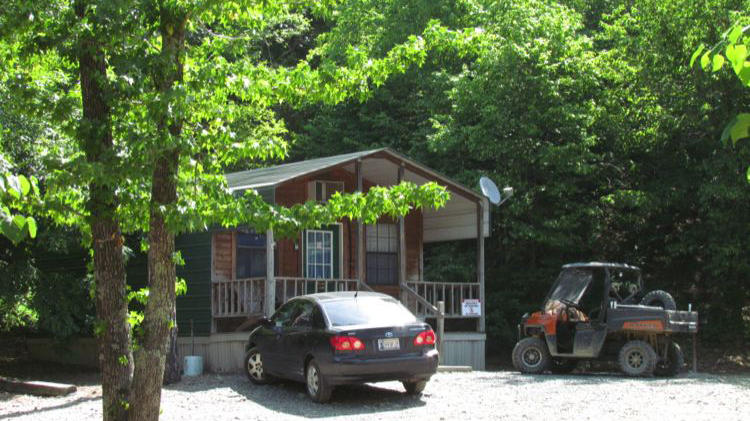 The “Sycamore” is a 2 bedroom cottage with all the amenities of home, and is wheelchair accessible. 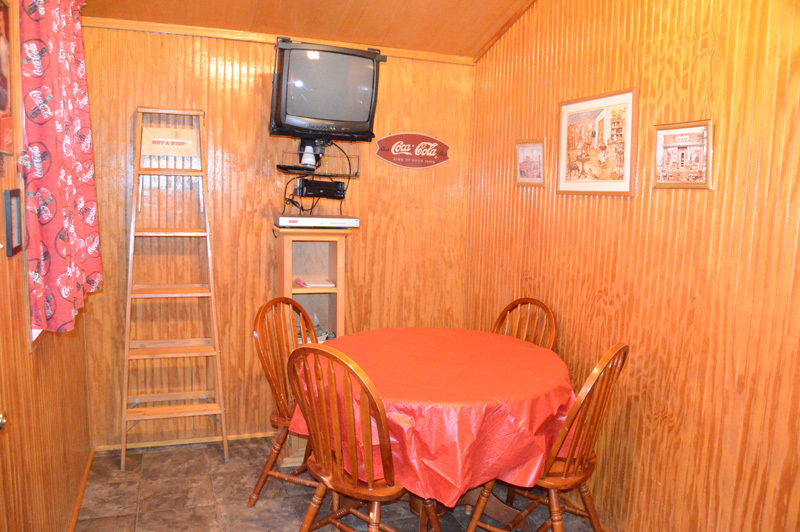 Decorated with Coca-Cola memorabilia, this is Jeff’s favorite as he is an avid collector. 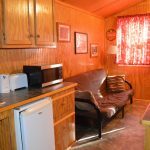 This cottage has a kitchen that includes a cook top, dorm size refrigerator, coffee maker, toaster, microwave and dishes. 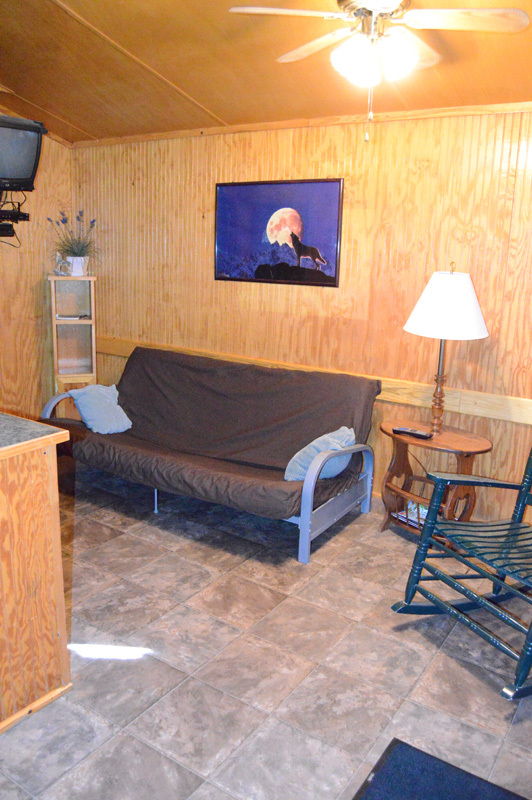 The living area has a futon couch (which makes into a full size bed), chair, and satellite TV with VCR. 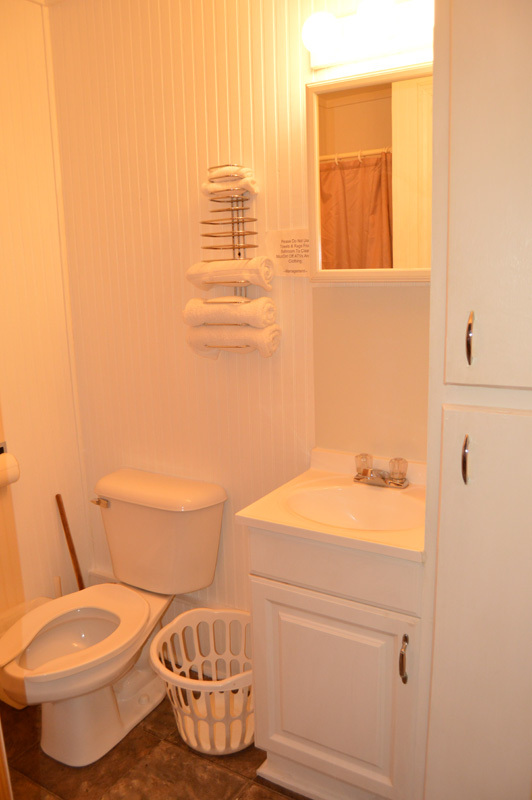 Full bath (shower, no tub) stocked with towels and toiletries. 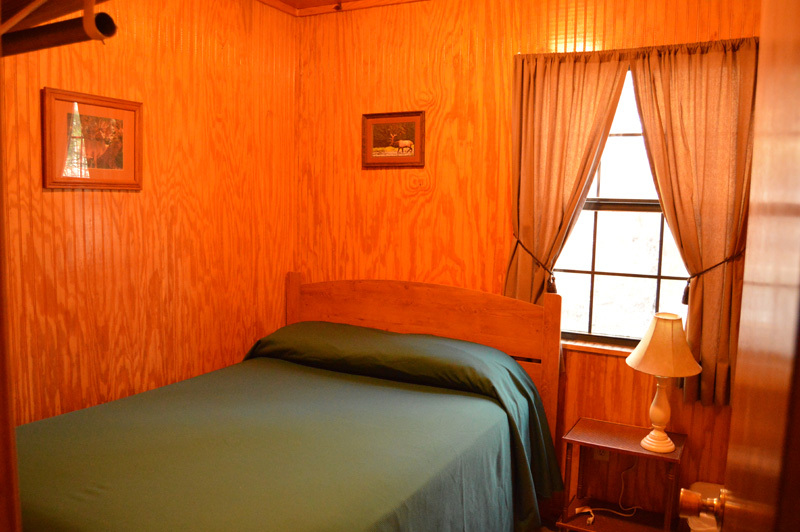 The bedrooms have full size beds. 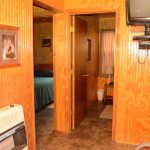 A/C & Gas heat. 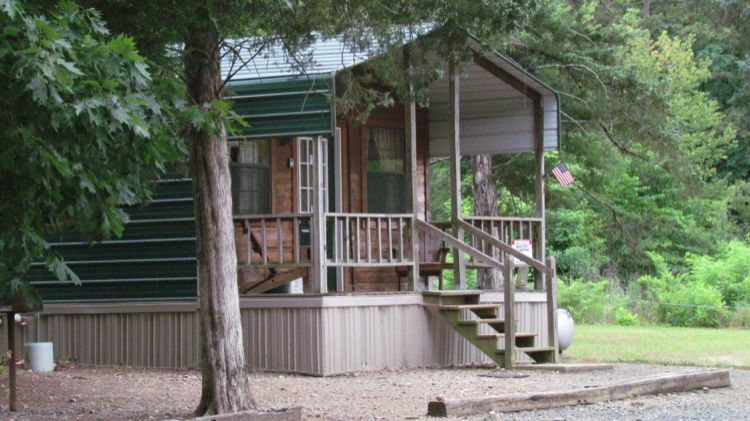 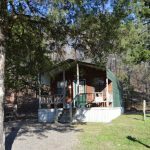 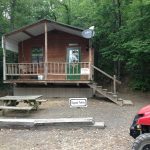 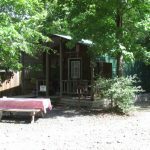 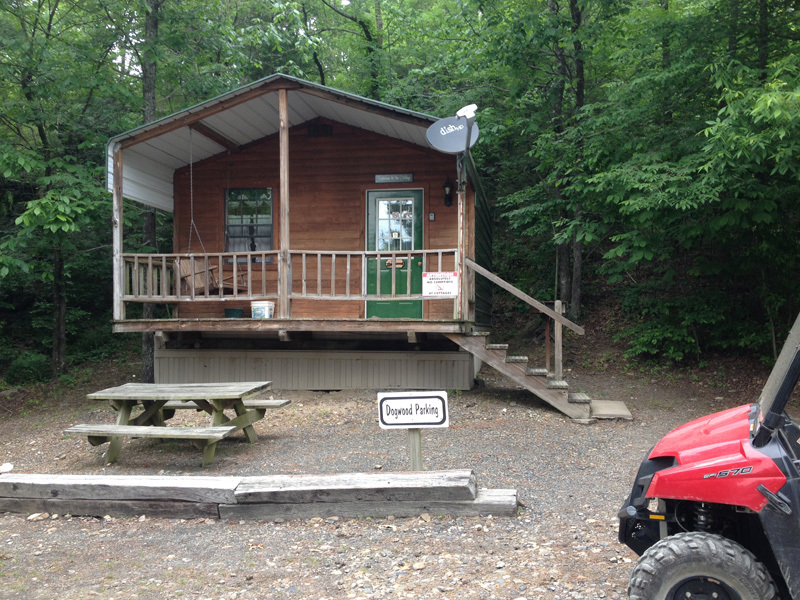 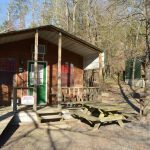 This cottage has a shaded front porch, and a picnic table and barbecue grill for special family time. 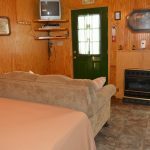 The “Dogwood” is sentimentally known as our “Honeymoon Cottage”, and yes, we’ve had numerous guests who have honeymooned on the trails! 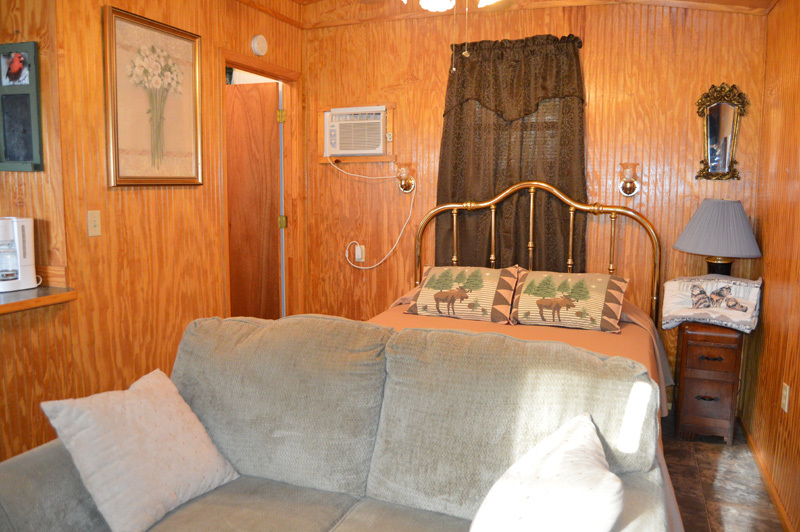 This is a one room cottage with a queen-size bed and love seat, especially designed for two people. 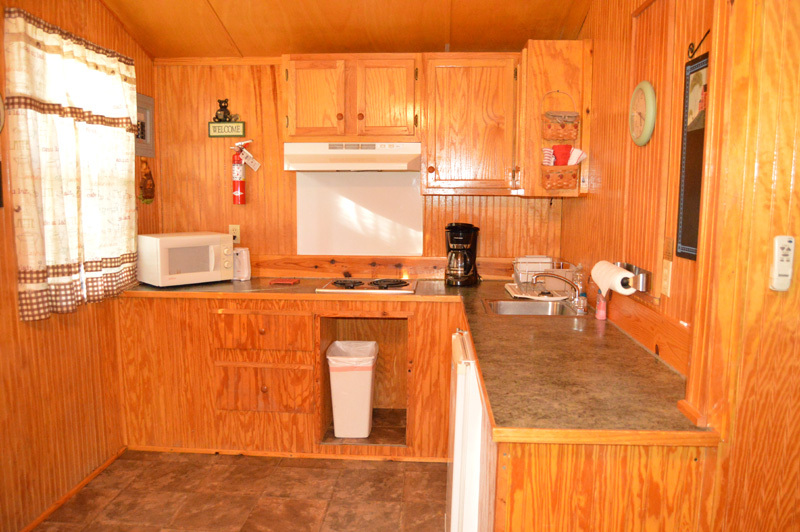 The kitchen includes a cook top, refrigerator, coffeemaker, toaster, microwave and dishes. 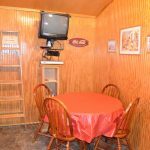 Satellite TV with DVD player. 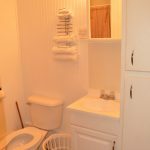 Full bath stocked with towels and toiletries. 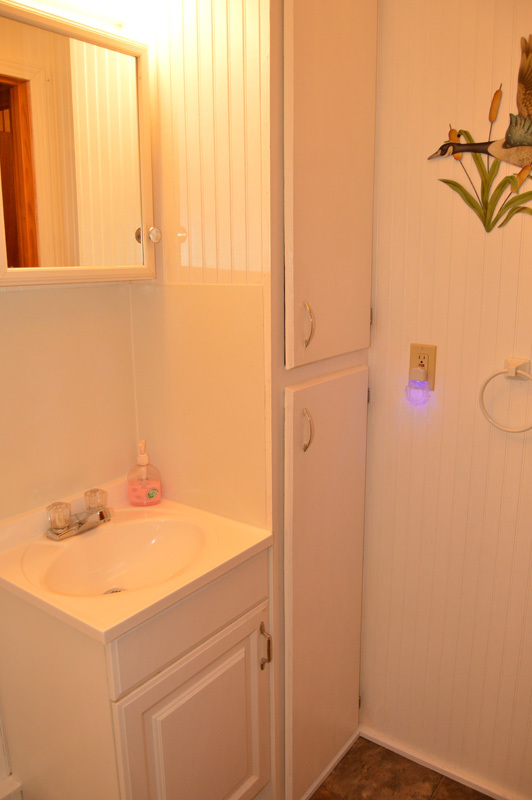 An extra special touch is the gas fireplace. 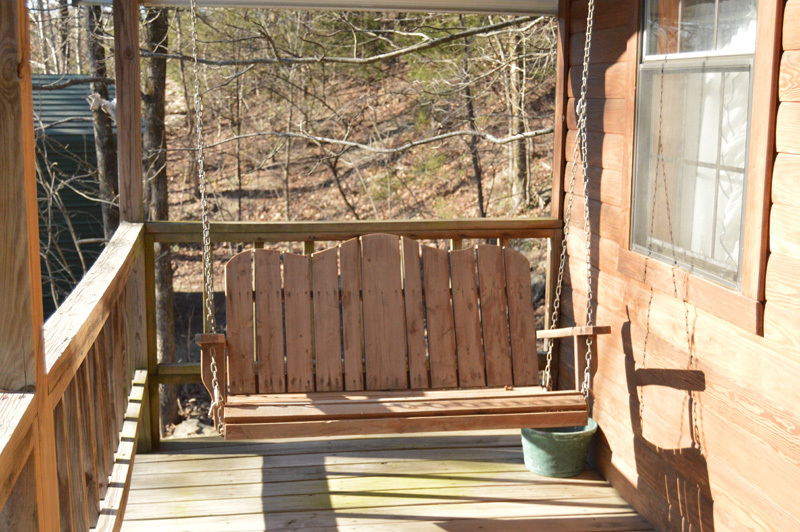 This cottage has an inviting front porch with a romantic, built for two, old-time porch swing. 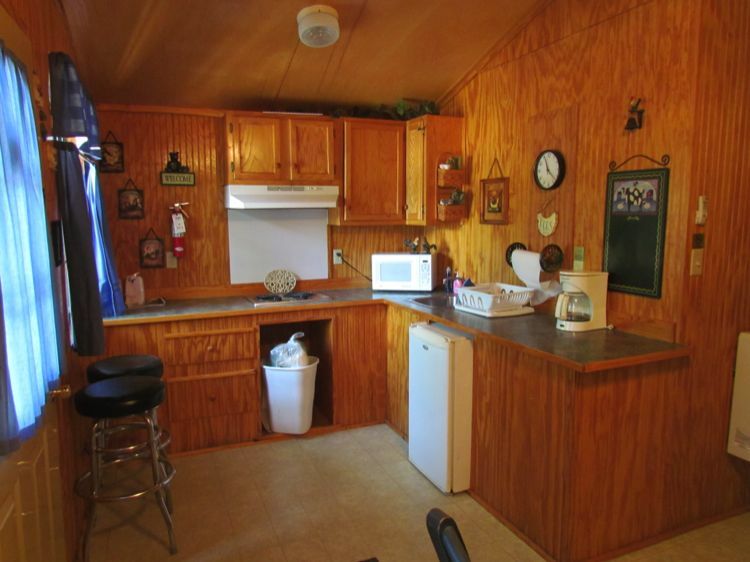 There is also a picnic table and barbecue grill. 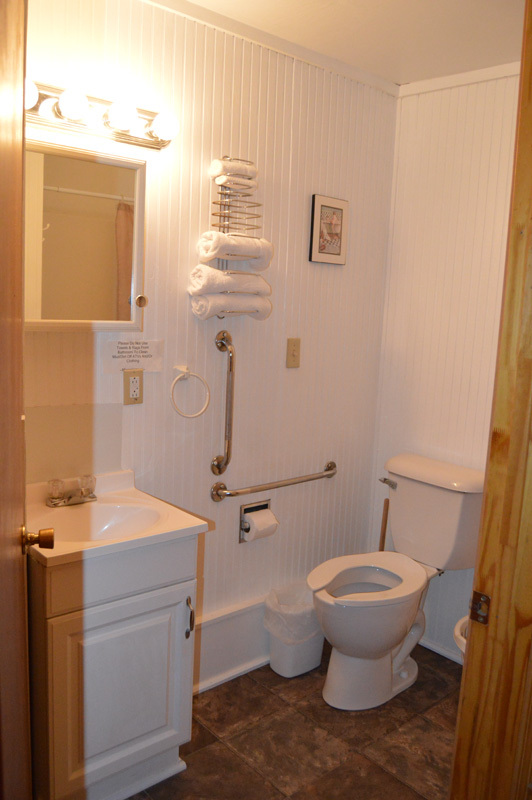 Full bath (shower, no tub) stocked with towels and toiletries. 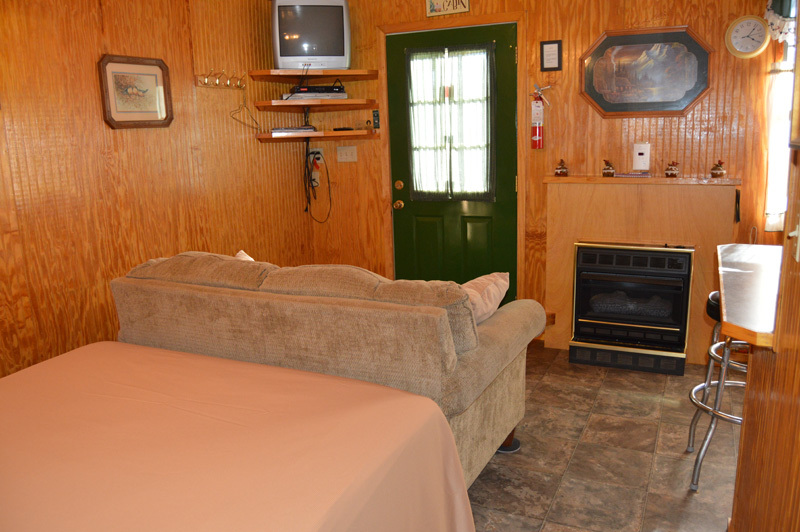 A/C & gas fireplace. 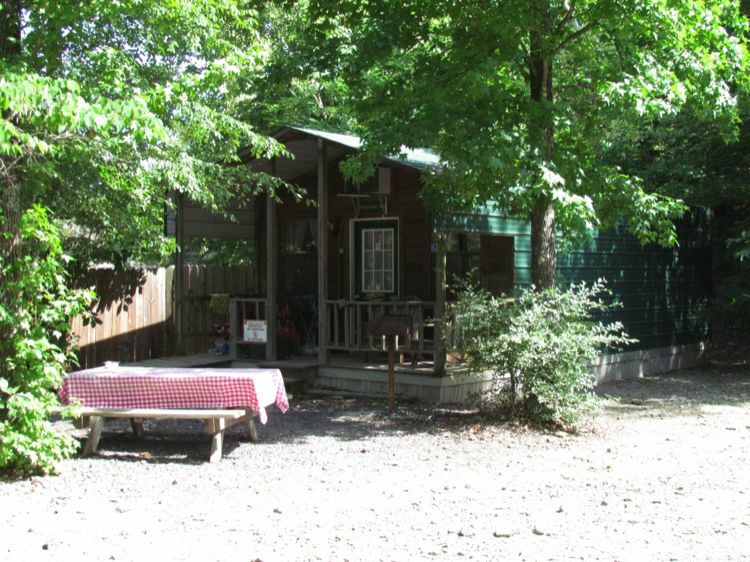 This cottage has a shaded front porch, and a picnic table and barbecue grill for special family time. 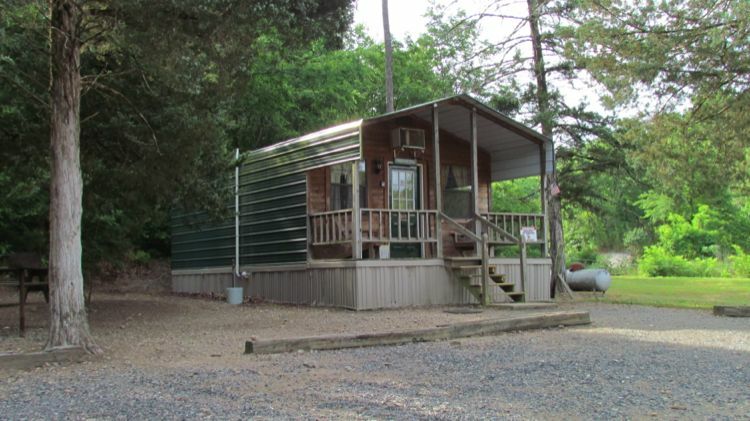 Sales tax is included in above rates.